Team Infinity is your best choice for all decorative concrete and refinishing needs – for both residential and commercial spaces. We’re very proud of each and every project we take on while making sure our client’s satisfaction is of the utmost importance. The best choice in decorative concrete and refinishing. Infinity is your best choice for your concrete surface restoration and modification needs. If you would like a complete facelift to your ugly, stained, cracked, chipped or otherwise unattractive concrete, we have many excellent choices for your home and business applications. Residential or commercial, there is no job too big or too small. Combined with over 20 years of experience we take an extreme amount of pride in our craft and workmanship. We use the industry’s most innovative, tried and trued manufacturers and highest quality materials. From our base coat primers, stains, acrylic modified overlay cements to your finished product sealed with a variety of polyurethane and epoxy finishes. Together we have completed thousands of projects in many aspects and process styles in the decorative concrete industry. We aim to please at turning any ugly, boring and drab concrete into a work of art. Get a free quote today! Bring your living space new life. Residential clients can expect us to deliver the same quality, due diligence and use the same commercial grade products as needed in your residential application, while delivering you a beautiful detailed finish. 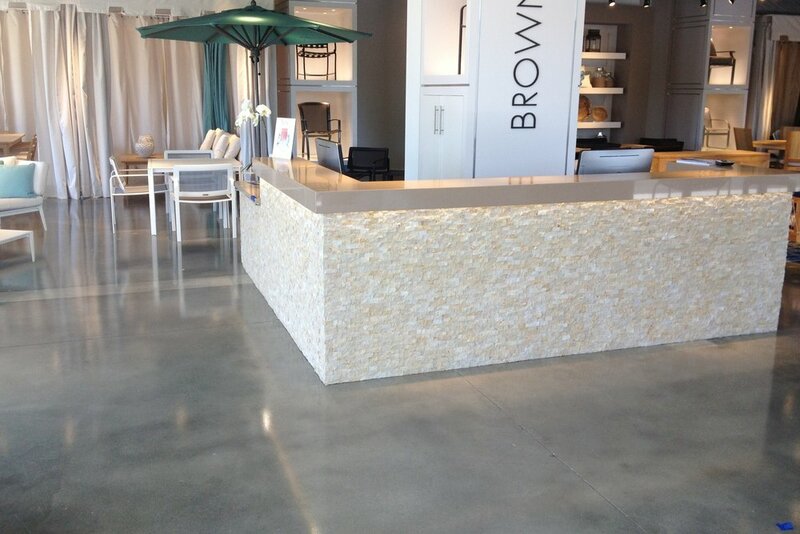 We have diligent craftsmen who take pride in their work so you can rest assured the nicest concrete finish possible. Commercial contractors and GC’s can count on us to to show up on time, deliver on time, all the while providing you a very competitive sub contractor pricing using the best quality and finishes in the industry to establish a long term relationship in this rapidly growing market of decorative concrete finishes. Infinity Concrete did an amazing job on our office floors. It completely transformed the look of our space. They also went above and beyond our expectations in terms of service. From start to finish Ryan helped us decide on the best process for our house and was more than helpful guiding us and talking out options to make sure we were 100% happy! Everyone who comes into our new home asks about our beautiful new floors! What is this? How did you do it? What color are they? They are so beautiful! Together we have completed thousands of projects in many aspects and process styles in the decorative concrete industry. We aim to please at turning any ugly, boring and drab concrete into a work of art.